Which kind of writer are you? You are an ebook writer, or want to be. You are an online content creator. If any of those items describe you, then 101 Writing Tips was written with you in mind. It's worded toward ebook writers and online content creators, but almost all the tips apply to anyone who simply likes to write. Tips 1-10 are about hot topics. This is real evergreen stuff that always draws a large audience. Tips 11-23 are about generating ideas. You'll never be stuck for an idea again. Tips 24-33 are about organization and goals. Don't wander aimlessly through your computer files or your aims in life. This section will optimize your assets so you can do what you love best. Tips 24-49 are about motivation. Only amateurs wait for inspiration to strike them. Pros know how to turn on the juice when they need it. Got juice? Tips 50-73 are about getting going when your stuck (breaking writer's block). Getting stuck is natural, staying stuck is not necessary. Tips 74-100 I call Quick Hits. The variety here can help you in many different ways. Tip 101 is about creating effective titles for ebooks and articles. This is a long tip, but you'll know exactly how to create titles that attract attention when you've finished it. If you do any kind of writing at all you're bound to get at least one good tip that helps your cause. At the low, low asking price, one tip is all it takes for your investment to pay off—but you'll surely get a lot more out of it than one tip. A Great Free Bonus is Included! Did you know you can write one article and sell it multiple times? Now imagine selling dozens of articles multiple times! If you enjoy writing, my special report, How to Get Paid to Write Articles, can show you how to build a residual (recurring) income writing and selling articles without looking for work and without direct sales. Forget about chasing freelance job after freelance job, that's too much work for too little reward. Wouldn't you rather just write? I sell this Special Report for $10.00 on this page. 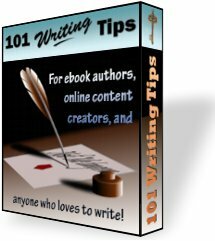 It's yours free with 101 Writing Tips. 101 Writing Tips is only HOW much? This ebook is 87 pages of solid writing tips and it's yours for around 15 cents a tip! I'm guessing that's a lot cheaper than you expected. It's true though, 101 Writing Tips is only $17.00 and you get the Special Report, How to Get Paid to Write Articles, that sells elsewhere on this site for $10.00. That's a super value just waiting for those smart enough to snap it up! Yes—I want 101 Writing Tips! 101 Writing Tips comes with a 30-day money back guarantee if you're not completely satisfied. Jumpstart your writing today, plus learn how to build a residual income selling articles. 101 Writing Tips is just $17.00 if you order today. Click the Order Now button to get YOUR copy! PS: Remember, with a 30-day money back guarantee the risk is all on me. You've got nothing to lose and some enlightening writing ahead of you—you deserve it! To help you achieve your writing goals and stay focused, many people are helped by creating an action plan. This plan will cover the steps you need to take to get you from where you are to where you want to be. Many folks tell you to set high goals. "Aim for the moon," they say, "even if you miss you'll be among the stars!" That's a nice aphorism, but it's inherent with emotional risk. If you set ten goals and you only accomplish three of them, how do you feel? Like a failure—at least that's how I feel. On the other hand, if you have ten reachable goals and you nail them all, how do you feel? Like a success—and that feeling fuels you on to accomplish more and more. I like to do what I call "transcendent" goal setting. I set realistic, reachable writing goals and then try to "transcend" that goal ( to go beyond my goal). I often set a goal of writing 10 pages per day for an ebook project if it's a subject I know well and won't have to do a lot of research. A person could write a 100 page ebook in 10 days at that pace. That's very good progress and I'm happy reaching that goal. However, if I reach the goal I'll try to transcend it and write 12 pages, or 15, or maybe even 20 pages if things are going particularly well. Then I feel great knowing I got so much accomplished! Some might say it's just a mind game I play with myself, but it's not a mind game, it is mind training. When you show your mind more successes than failures it comes to expect success. The point is to set daily writing goals. If you're not as experienced as I am, a realistic goal may be just two or three pages, or even just one. Make your goals realistic and achievable, but not so easy that there's no challenge at all. Then follow your action plan, building success upon success, and you'll soon be positively prolific! Whenever possible, show your readers what you want them to know rather than telling them what you want them to know. Not sure of the difference? Telling: When Dennis released his latest ebook he sold 57 copies the first day. Showing: Dennis leaned back in his chair. A smile crossed his face as he counted his sales. All in all he made 57 sales in one day, a new record. Tonight, he and his wife would celebrate! Telling plants ideas but is boring. Showing gets the same ideas across but plants mental images in the reader’s mind, which is more interesting.